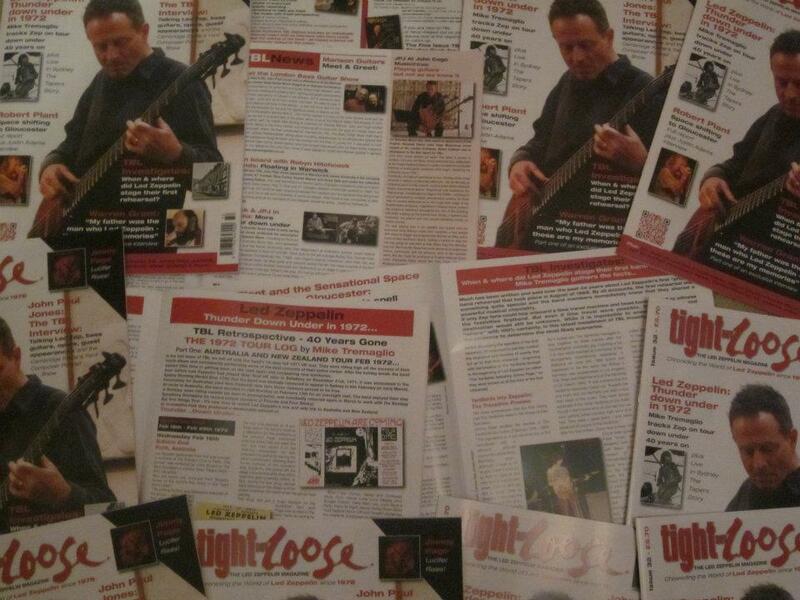 Tight But Loose » Blog Archive » DAVE LEWIS DIARY:TBL 32 OUT NOW/ BONZO’S BIRTHDAY PARTY ON THE OCCASION OF HIS BIRTHDAY/DIAMOND JUBILEE/HAPPY BIRTHDAY SAM! DAVE LEWIS DIARY:TBL 32 OUT NOW/ BONZO’S BIRTHDAY PARTY ON THE OCCASION OF HIS BIRTHDAY/DIAMOND JUBILEE/HAPPY BIRTHDAY SAM! 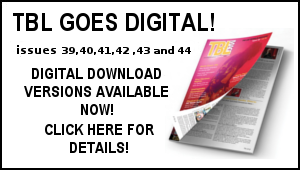 The new issue of the TBL magazine TBL 32 is now out and on the streets. The stock was delivered on Tuesday and I spent the day packing them into the envelopes that I’d spent the weekend sticking stamps on. 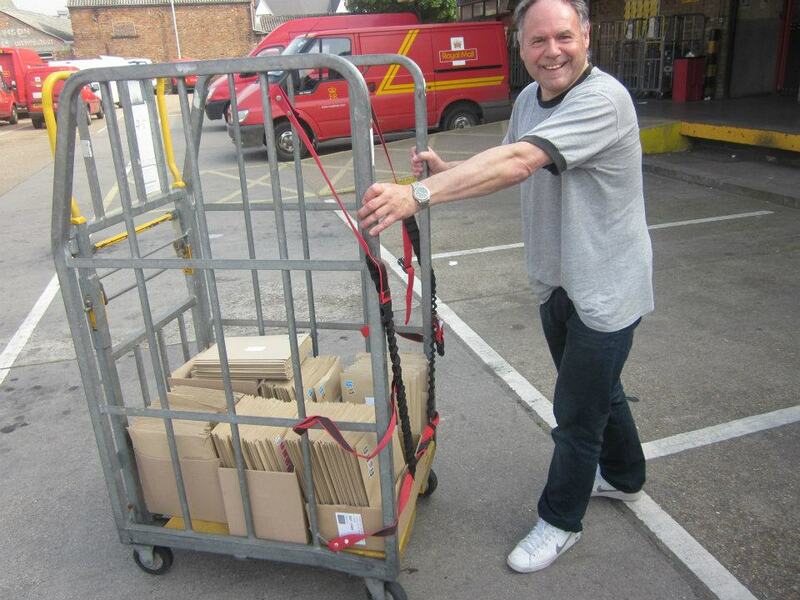 The good lady Janet and myself then took a bulk of the packed magazines down to the main Royal Mail sorting office. So I counted them all in….I counted them all out. All subscribers copies have now been dispatched – UK subscribers should have their copy by the weekend with Europe and the USA, Japan, Australia etc to follow in over the next couple of weeks. It’s a source of much pride that TBL currently reaches out to Led Zeppelin fans in over 20 countries spanning the UK, America, Canada, Mexico, Ecuador ,Brazil, Argentina, Indonesia , Israel, Turkey, Russia, Germany, France, Spain, Italy, Finland, Norway, Poland, Denmark, Sweden, Switzerland, New Zealand, Australia, Hong Kong and Japan. A massive thanks to Gary Foy for all his admin assistance and to Mike Tremaglio, Simon Cadman, Ian Avey, Jeff Strawman, Gerard Sparaco and Gary for their contributions and Mick Lowe for a fantastic design. As I mentioned last week, I think this is one of the best ever issues –but now it’s out there… it’s for others to judge – so let me know what you think. Hopefully you are going to enjoy reading it as much as I have writing and collating it all. As ever it’s been a long and winding road from the first text plan back in January to the completed 32 page issue that finally arrived from the printers on Tuesday. As usual it has come together in between various other stuff and projects going on here – not least work on the updated From a Whisper to a Scream Complete Guide book -plus all the goings on here, health stuff, domestic trials, battles with the old black eyed dog -you know the rest as my mate Tom says and at this point may I offer thanks to the good lady Janet for all her support here. 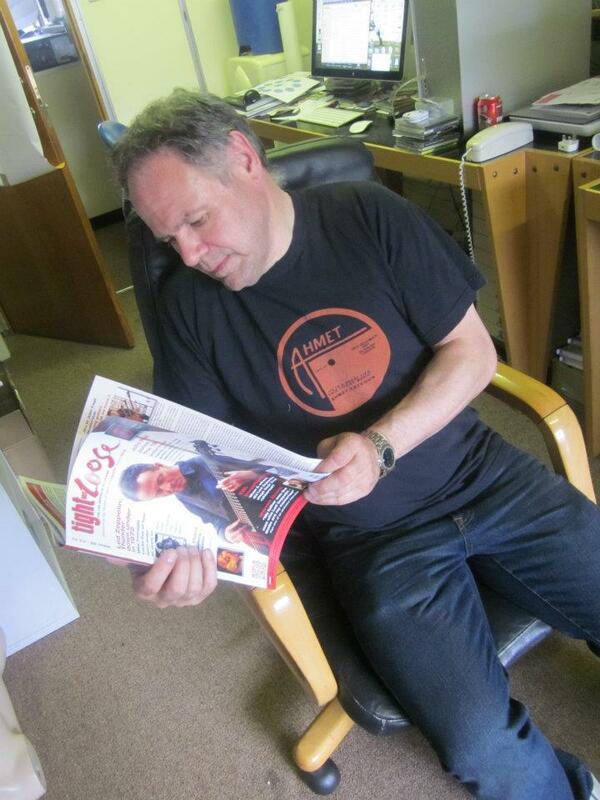 Looking it over the magazine yesterday at Mick’s studio put me in a reflective mood before it all moves on. The highlights of this issue for me are Mike T’s fascinating TBL Investigates feature which over nine pages really puts into context the Yardbirds into Zeppelin transitional period – the Warren Grant inteview (of which there is more to come next time), the Live In Sydney Tapers Story which I am sure will prompt fresh listening to that era plus of course the John Paul Jones interview. The contributions of Simon Cadman, Gerard Sparaco , Ian Avey and Jeff Strawman all offer key insight on a variety of topics. Tales of Gary and I running around London in the name of TBL research and Space Shifting in Gloucester plus the arrival of Lucifer Rising also cover the recent events that have unfolded. As I was sticking on all the labels etc earlier this week, I was struck by how many familiar names there are amongst the TBL subscription base – many who have been on board right from the start of all this some 34 years ago. As the magazine reaches the 32nd issue, the same values of that hand written first issue still applies -to offer a platform of communication for this passion that we share in celebrating the music of this great band and the world that surrounds them. 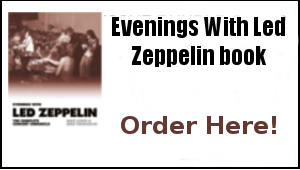 In doing that, this chronicling of the Zep word has become much more than a mere magazine – it has developed into a fellowship of like minded fans and I know many friendships have been formed over the years between it’s readers, indeed I have been lucky enough to form lasting bonds with many fans across the world. It’s a heartwarming aspect of the whole TBL premise of which the TBL magazine remains at the core. 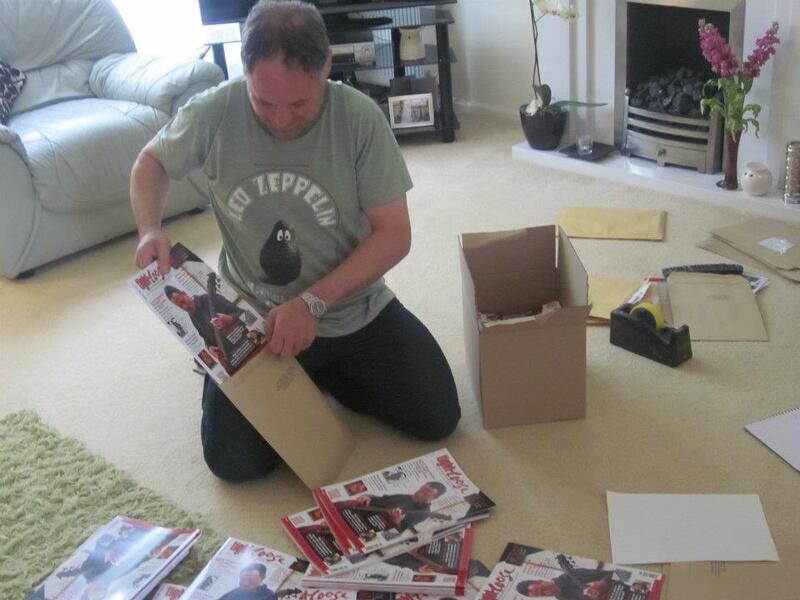 Sharing this passion by the medium of the tangible printed Zep word. So all in all, It’s a great feeling to have some fresh TBL product out there to share and inspire. 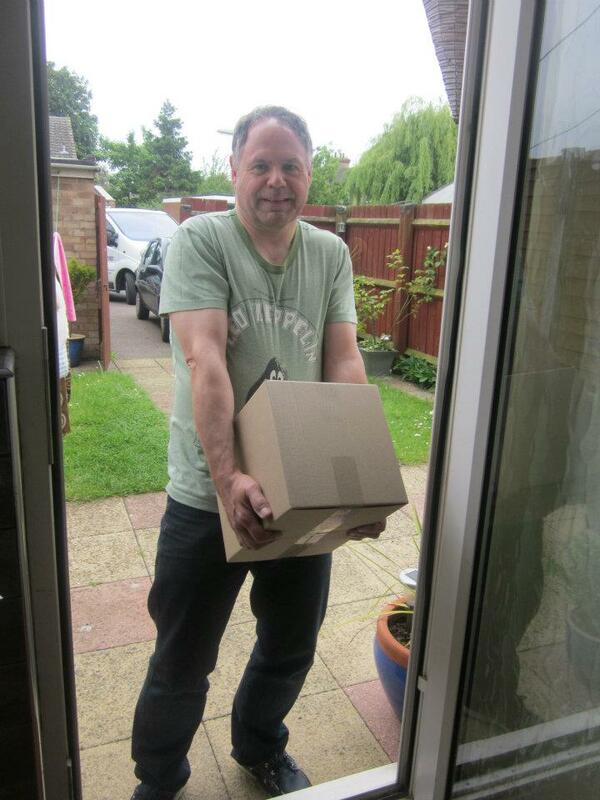 Above: 5pm May 29th 2012 -The TBL Distribution manager hands over the first packed copies of TBL 32 mags to the Royal Mail – your copy is in there somewhere! TBL 32 is also available to buy as a single issue – if you are new to TBL and want to test it out –now is the time! I am sure you will be back for more! As I said earlier, let me know what you think – and while you’re at it, anything you can do to spread the TBL word is much appreciated – ie tell your Facebook friends and Twitter followers. 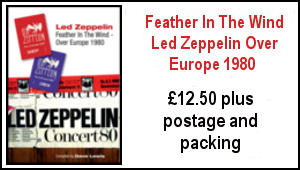 Invest and enjoy another tangible physical TBL product that takes you ever closer to the world of Led Zeppelin. 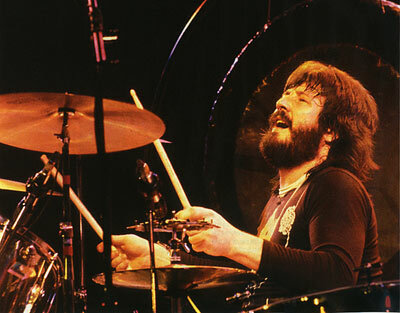 Today (Thursday May 31st) is John Bonham’s 64th birthday. Over in America, Brian Titchy and Joe Sutton are celebrating this date by staging the Bonzo’s Birthday Bash at the House Of Blues Los Angeles. An admirable gathering of many drummers paying tribute to the memory of the man they consider the best at his profession. I look forward to hearing a full report of the star studded percussive performances. Here today, I’ll be pulling out a 1973 recording that captures the real heart and soul of what John Bonham was to Led Zeppelin. 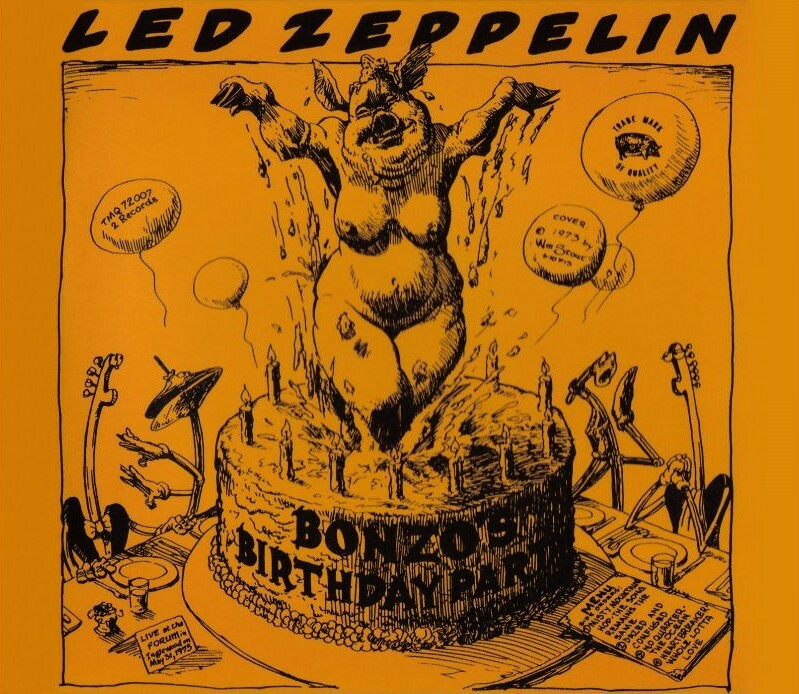 Those were the first words spoken onstage by Robert Plant at the Inglewood Forum on the night of May 31 1973 and they are the first words heard on the famous double album bootleg set on the Trade Mark Of Quality label titled Bonzo’s Birthday Party. I purchased this album in early 1974 and it still sounds amazing – principally because there are so many classic Bonham moments to be enjoyed. Amongst them the superbly mannered timekeeping in No Quarter (which again highlights that it was often the space he left between the beat that made Zeppelin instrumentally what it was)… the riotous delivery of The Ocean (proceeded on the album by that absurd ‘Prunes from California’ ad break) and that great link that joins Heartbreaker to Whole Lotta Love. Playing that album again it becomes so evident what was lost to us all that dark day in September 1980…but also what still remains. The John Bonham sound still resonates today from the countless tribute band drummers that try to emulate his style on stage nightly around the world … the many Levee Breaks samples that backtrack all manner of dance orientated acts and the array of guitar and metal based bands who lean heavily on the incessant percussive swing that John Bonham trademarked with Led Zeppelin from 1968 to 1980. Gone … but never ever forgotten … and still so frequently heard. It’s a big weekend ahead here with the celebrations of the Queen’s Diamond Jubilee and on Monday it’s our Sam’s 22nd birthday and we will be celebrating with her here. I’ve relayed this tale plenty of times, but 22 years ago on Monday June 4th 1990 I awoke with the prospect of a couple of Robert Plant gigs ahead over the next two nights. These were the London dates Robert was playing in support of the Manic Nirvana album. Tickets were sorted, arrangements made – I was going with my good friend Terry and a couple of the boys I worked with and planned to hook up with Gary Foy and the TBL crew in Hammersmith. The good lady Janet was pregnant and our first born was due in July. Well it didn’t quite work out like that. On that morning of June 4th , Janet informed there were stirrings… and sure enough there were. Off we went to Bedford North Wing hospital where we were informed that our forthcoming bundle of joy was ready to enter the world. I was back the next night for gig number two with Terry celebrating Sam’s birth with a skinful of Directors ale. Later in the month I was at Knebworth with Mr Foy for Robert & Jimmy’s reunion. What with the World Cup Italia 90, World in Motion at number one (Cue the John Barnes rap : ‘’You’ve got to hold and give – but do it at the right time – You can be slow or fast but you must get to the line’’) – it was all going on during that June of 22 years ago for sure! It was also all going on 35 years ago when the Queen was celebrating her Silver Jubilee. On the day (June 7 1977), Zep were performing at Madison Square Garden and Robert made reference to the fact the celebrations were going down back in the UK. Little known Zep Silver Jubilee trivia: When I saw the band flying out from Heathrow on May 17, Robert was sporting a button badge of the Queen. Jimmy of course was in the presence of the Queen last week at the Royal Academy of Arts Celebration event. 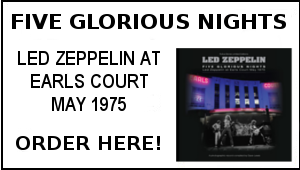 Until then enjoy TBL 32 – another outpouring of Zep related news, views and features to kick start the summer -and have a great weekend. Dave and all the TBL crew looking forward to my issue. As far as John’s birthday I wish he was here to celebrate it with the world. He remains the best drummer the rock world has ever seen. Has to be the most comprehensive yet. Simply loved the Warren Grant piece, what an amazing upbringing he must have had. Best wishes to the TBL crew. Great ,another fantastic mag ,loving the OZ boot tour section.My only complaint now is…………………..having to wait a good few months for the next issue.Well done Dave and all involved in another great zep fest. Another excellent issue Dave. Looking forward to a good read. Dave, just got the latest TBL mag.BRILLIANT AS EVER! I urge everyone to subscribe to Dave’s TBL Magazine it’s excellent for all things ZEP.Best wishes SWIN. 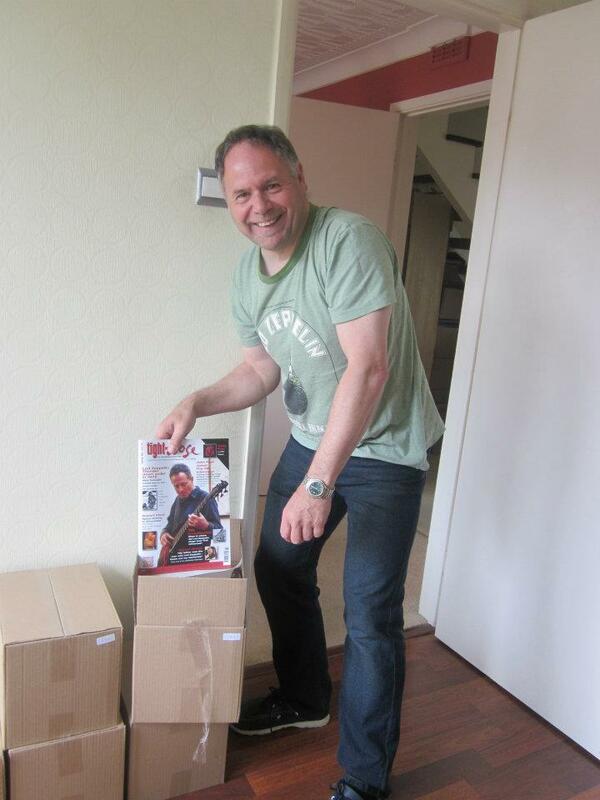 I have just recieved the last issue of TBL ! The very best thing I can find in my mail box. Thank you so much for the great job you do for all fans of Led Zeppelin. By the way, I recieved it on May the 31st … !! Happy Birthday Bonzo !! RIP. IS DEFINETLLY MISSING OUT IM LOOKING OUT FOR THAT POSTMAN. Bonzo, you are much loved and still missed by your fans. Your star will always burn brightly in the rock and roll heavens. Thank you for the time you gave us as well as the music that was in your heart. Always imitated, never to see the like of you again, truly a one of a kind timekeeper,indeed, to me, the Ultimate Timekeeper. Rest in Peace now and for always, John Henry Bonham…..